Do your cats like each other better than they like you? 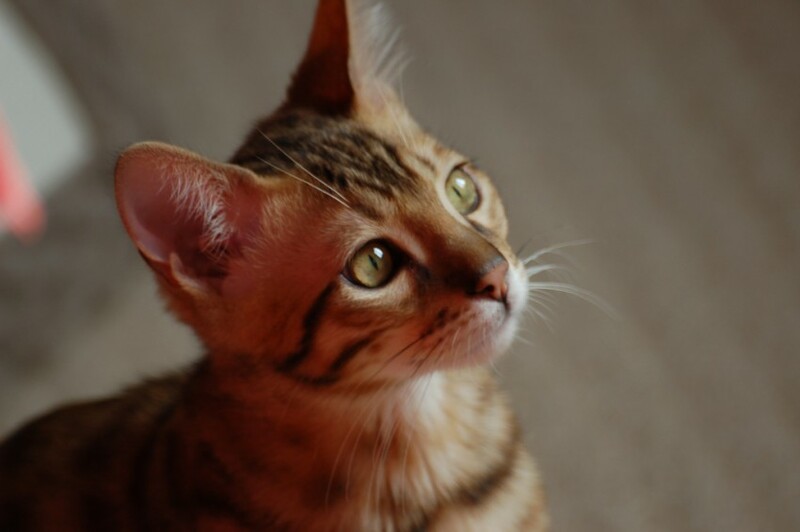 Read my response to a reader who needs help bonding with a bengal cat. It sounds like your bengal cats have bonded with each other, not you, and are feeding off each other’s bad behavior and wild natures. The only way to get these kitties to interact with you is to strengthen your bond with both of them, which will require patience, time and dedication — and there’s no guarantee your efforts will be successful. The bengal cat is a relatively new feline hybrid of a domestic cat and an Asian leopard cat, a small wild cat native to, you guessed it, Asia. The cross produces gorgeous cats, but they only make good pets if they are four generations (F1 through F4) removed from the original breeding. Because bengals are so genetically close to their wild ancestors, they can revert back to wild or feral behavior in certain situations, even if they are F4 or above. There’s no real way to predict when this will happen, which is one of the disadvantages of hybrid cats. If your new kitten is of a relatively low number, she may not be well-suited to live as a housepet. If you don’t know her generation, contact the breeder for more information. Although experience and common sense tells us that animals are usually happier in pairs, that general rule isn’t always applicable to every animal. In certain situations, it’s best for your pet to be an only child. Littermates: Although kitten siblings are adorable together, adopting two from the same litter is not always the best idea. In many cases, the kittens will bond with each other and therefore have little use for a human. If you want two kittens — which is an excellent idea! — visit your local animal shelter and adopt two kittens from different parents. Dominance: If your resident pet has dominance issues and clearly prefers to be an only cat, don’t push the issue. When cats aren’t happy, they act out, usually by peeing on things or shredding them. If your cat wants to be an only cat, let her! If you must have another cat, get a very young kitten, who might not be as much of a threat. Separation Anxiety: If your resident cat (or dog!) is anxious and acts out when you’re gone, she probably has some level of separation anxiety. Unfortunately, getting the pet a friend to keep her company often backfires. Separation anxiety isn’t caused by loneliness, but by separation from her person. If your pet’s separation anxiety “rubs off” on the new cat, you’ll be stuck with two pets who wail and act out when you’re gone. First treat the problem, and then welcome a new cat into your home. Socialization: If you aren’t home much or don’t have the time or energy to properly socialize a new pet, consider holding off on adopting a second cat. Without proper handling and treatment, your new cat might decide she likes the resident cat better than you … which is what seems to have happened in your case, Anonymous. Bad Behavior: Bad behavior can beget bad behavior. If your resident cat displays unwanted traits, getting him a friend won’t necessarily solve the problem. In fact, it could exacerbate it! If your pets decide the naughty behavior is more fun than behaving, they’ll have a partner in crime. If you’ve learned the hard way that more isn’t always better, you should try to fix the situation before any more time passes. As kittens become cats, they become more set in their ways, and their behavior is more difficult to change. If your cat is feral, under-socialized or standoffish — or if she just plain doesn’t like you! — you’ll need to give her a reason to want to spend time with you and endure your advances. Grabbing your cat or forcing attention on her will only worsen the problem. Be patient, and try these strategies. Ignore your cat: Have you ever noticed that given a choice of laps to sit on, a cat will always pick the person who dislikes cats the most? While it’s true that cats like to mess with people, the real explanation is that cats interpret human attempts to catch, pet, cajole or otherwise force their attentions on the cat as aggressive behavior, and who wants to be friends with someone aggressive? By ignoring your cat, you not only refrain from behavior that could be interpreted as aggressive, but also pique her interest. Bribe your cat. I’ve never met a cat who didn’t want to gobble down a freshly opened can of tuna. If the kitty won’t come out from under the bed, slide the can under. Move away from her, but don’t leave the room. If she refuses to take your bribe, retrieve it and leave. If you allow her to eat it when you aren’t in the room, she won’t learn to associate you with the yummy treat. Talk to your cat: When you’re in the cat’s presence, talk out loud as you go about your business. You don’t have to make meaningful conversation; the sound of your voice is all that’s important. As your cat becomes more adjusted to the way you sound, he will begin to relax more in your presence. Read to your cat: I have found that one of the most effective ways to make a cat more comfortable in my presence is to read to her. If she’s hiding under the bed, I’ll close the door, sit on the floor and read out loud from a book or magazine. Your cat will have the chance to become familiar with your appearance, sounds and smells and become more comfortable around you. It’s important to avoid making eye contact or trying to interact with the cat; you’re there to let the cat observe you while you do something safe and nonthreatening. Intrigue your cat. As you spend quiet time with kitty, come prepared with toys, especially those she plays with when she’s ignoring you. Don’t attempt to play with her; simply make the toys available when you are in the room — and only then. You want her to welcome your presence as a harbinger of super-fun playtime. When your cat feels safer with you and begins to become more interested in you as a caregiver and toy supplier, she may begin to make overtures. Don’t rush the process. Allow her to come to you at her own pace. She may never be as affectionate as you’d like, but with patience and compassion, she may learn to love you on her own terms. If you are in the same situation as Anonymous, with two cats who like each other better than they like you, follow the same process, making sure to include both cats. As they come to accept that good things happen when you’re around, they’ll be more inclined to want to spend time with you.